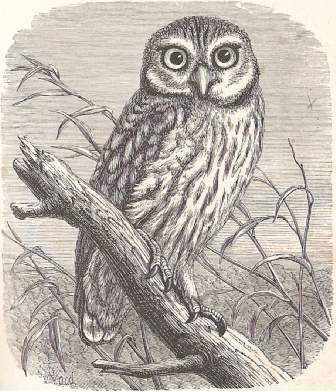 The Little Owl was also known in the past under the name of the Little Night Owl, as indicated by its Latin name Athene noctua. Though rare in England, it is very common in many parts of the Continent, where it has been known to be much valued by bird-catchers, who would employ it as a means of attracting small birds to their traps. They would place it on the top of a long pole, and carry it into the fields, where they would plant the pole in the ground. This Owl has a curious habit of swaying its body backwards and forwards, and is sure to attract the notice of all the small birds in the neighbourhood. It is well known that the smaller birds have a peculiar hatred to the Owl, and never can pass it without mobbing it, assembling in great numbers, and so intent on their occupation that they seem to be incapable of perceiving anything but the object of their hatred. Even rooks, magpies, and hawks are taken by this simple device. The Little Owl can be found in almost any locality, caring little whether it takes up its residence in cultivated grounds, in villages, among deserted ruins, or in places where man has never lived. It prefers the neighbourhood of villages, and may be seen quietly perched in one of its chosen favourite spots, not taking the trouble to move unless it be approached closely. And to detect a perched Owl is not at all an easy matter, as the bird has a way of selecting places to perch where the colours of its plumage harmonize so well with the surrounding objects that the large eyes are often the first indication of its presence. Many a time a birdwatcher has gone to search after Owls, and only-been made aware of them by the sharp angry snap that they make when startled. The name Athene, has been given to the Little Owl because it is the species selected by the Greeks as the emblem of wisdom.